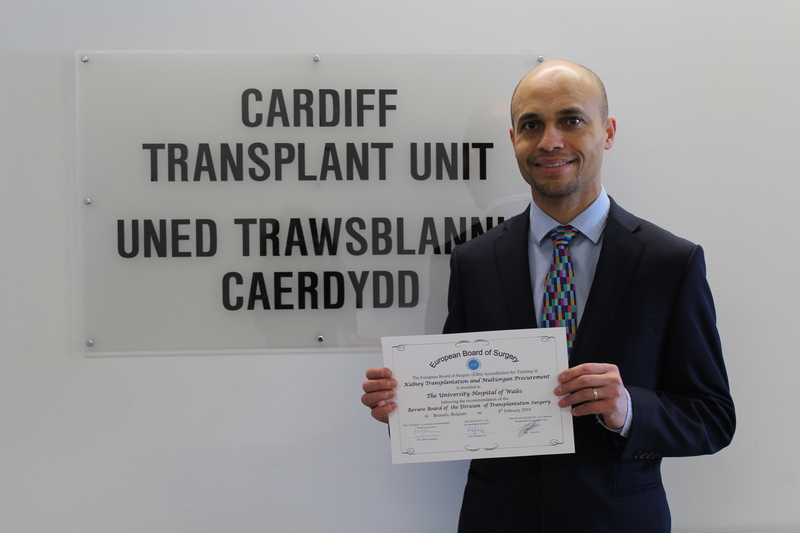 The Transplant Unit at the University Hospital of Wales has become the first transplant centre in the United Kingdom to be accredited by the European Board of Surgery (EBS). The accreditation applies to kidney transplantation and multi organ retrieval, and follows a recommendation by the Review Board of the Division of Transplantation Surgery in Brussels. Transplant fellows who undertake training at the Unit will receive accredited specialist training in transplantation and multi-organ procurement and prepares them for a European Diploma in Transplant Surgery, which is organised by the Division of Transplantation of the UEMS in collaboration with the European Society of Organ Transplantation. Mr Elijah Ablorsu, Consultant Transplant and General Surgeon was instrumental in the application process in putting Cardiff forward as a centre on learning excellence. Elijah said: “I’m delighted that Cardiff Transplant Unit has been chosen as a national centre of learning by the EBS. We are proud to be training the next generation of Transplant Surgeons who will go on to make a huge difference to people’s lives by getting them off dialysis, curing their diabetes and improving their quality of life, which is immeasurable.